If you’ve ever watched a cooking show or competition, it’s pretty easy to start getting kitchen envy within the first few minutes of the show. Seeing all of those beautiful appliances – big, beautiful and made of stainless steel – and all of the awesome gadgets that are available for the chefs to use, can really make you think that your kitchen could never compare. 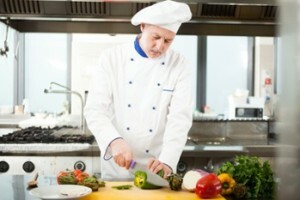 Creating a kitchen that makes you feel like a professionally trained chef isn’t as hard as actually becoming a chef, it’s actually quite easy. The appliances you choose in your kitchen can determine what you are able to do in the space. This isn’t regarding design, but quite literally what type of cooking you can do. Having an industrial sized cooktop may not be the best fit for your kitchen, so instead, use a larger eight burner cooktop in place of the standard four or even six burner top. This allows you to work on multiple courses at a time. When choosing appliances like ovens and microwaves, think about convenience and how you will use the appliances. Double ovens in a chef’s kitchen are a must if you plan on cooking multiple dishes at one time, whereas drawer microwaves are great for keeping counter space clear if you don’t want to install the microwave above the stove. Concerning the sink area, a chef’s kitchen sees a lot of dirty pots and pans. If you’re planning on using your kitchen at every chance you get, having a large sink that can hold it all should definitely be on your list. Installing a larger sink is great for getting dirty cookware out of the way when you’re prepping and cooking a meal. Also consider hands-free faucets that will turn on with just a tap. This keeps you from getting the faucet messy during prep, and will be a big help if your hands are full with dishes. For more on the design of your kitchen fit for a chef, stay tuned!